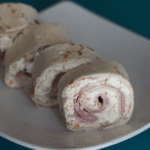 Learn how to make green olive and ham roll-ups. Dice green olives and cocktail onions, mix with cream cheese. 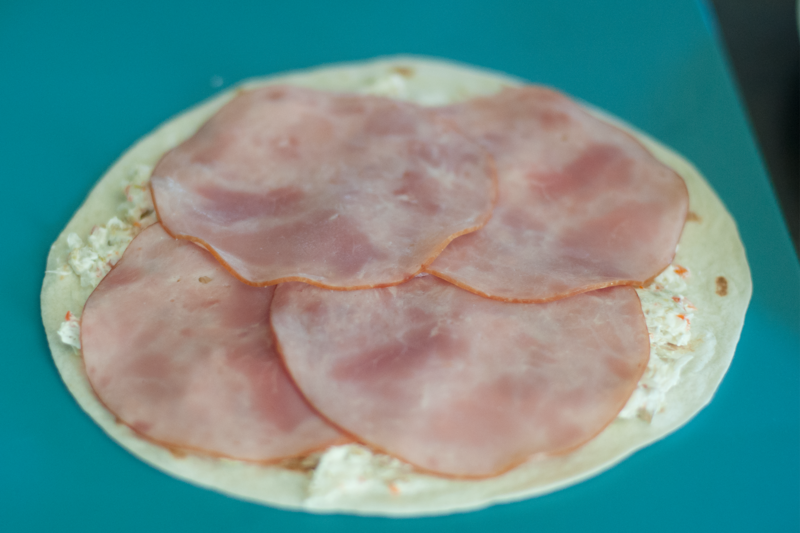 Spread on tortillas and top with ham. Must love green olives! I must admit this recipe was a bit of an experiment. I combined a family favorite green olive dip with our pickle ham roll-ups, minus a few ingredients. I am pleased with how it turned out. But I am a big green olive fan! 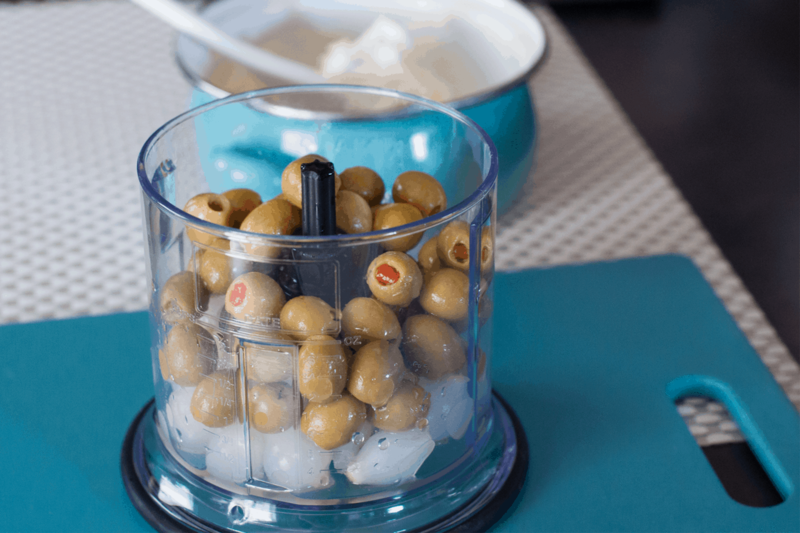 Liking green olives is a must because of the prominent olive taste – you have been warned. 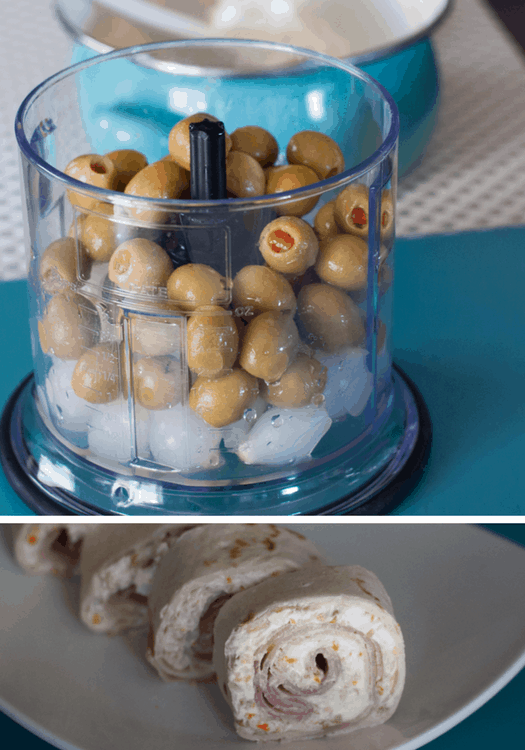 A great recipe for special occasions like a bridal or baby showers. Or bring along to a summer barbecue. 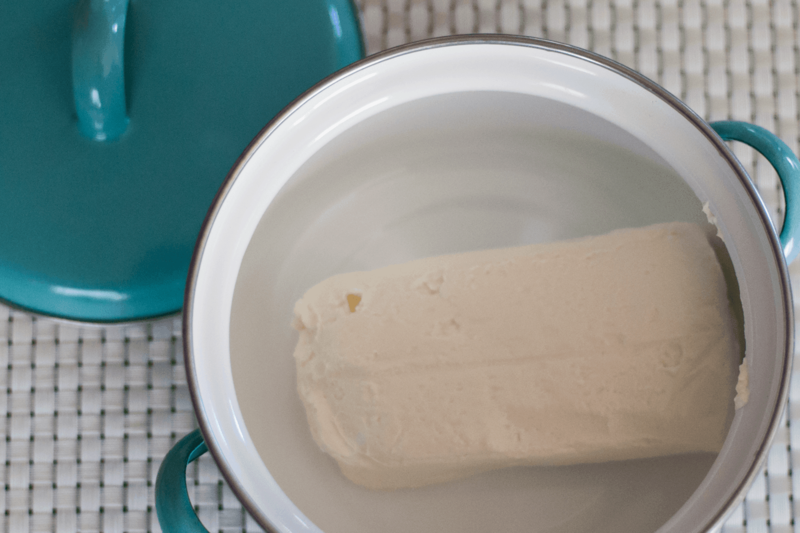 You can start by leaving the cream cheese out to soften. Or soften in the microwave on defrost; however, make sure it doesn’t melt. Add the cream cheese to a small bowl. 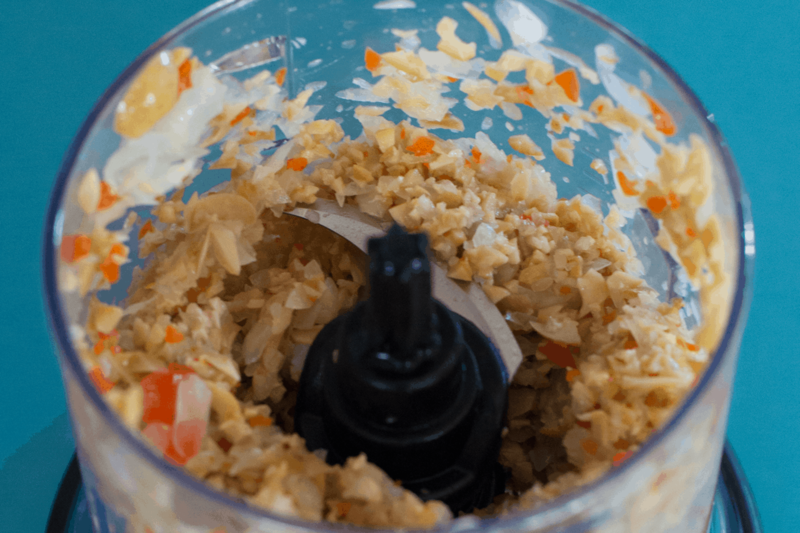 Then, drain the juice from the cocktail onions and add to a food processor. Next, drain the olives and add on top of the onions. It’s very important to drain both, you don’t want the cream cheese to get runny. Chop into small pieces. It won’t look very appetizing at this point, but trust me it will taste good! Add the cocktail onion and green olive mixture to the cream cheese. Mix well. 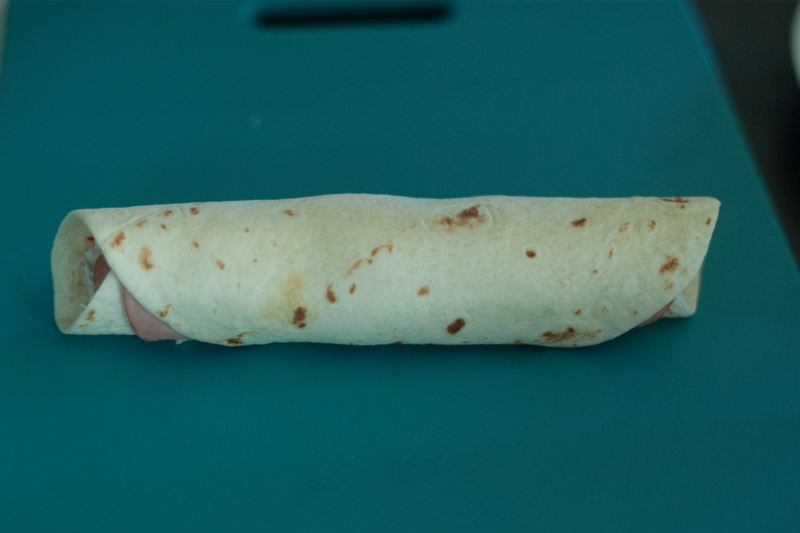 Now you’re ready to assemble the roll-ups. 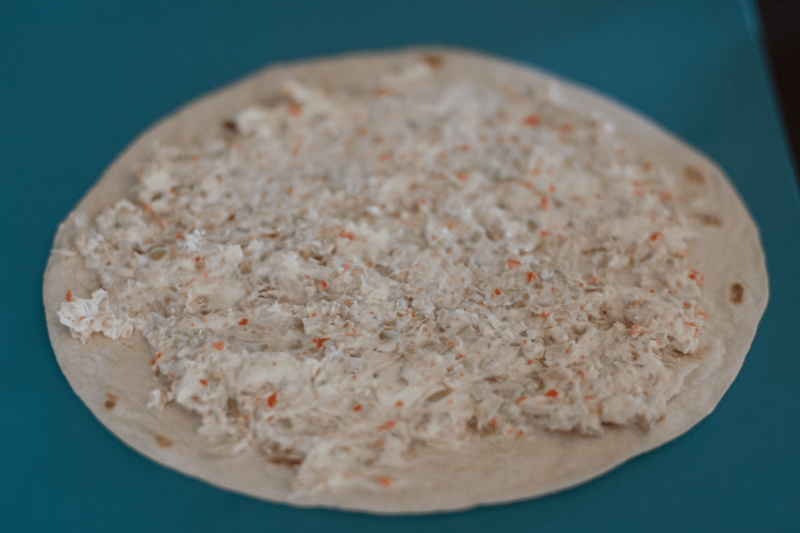 On a cutting board, lay out one flour tortilla. Spread with a generous layer of the cream cheese and green olive mixture. Top with 4 slices of deli ham. Roll tightly from end to end (important or they will fall apart easily!). Repeat these steps until all of the cream cheese and olive mixture is gone. Arrange the roll-ups on a serving tray and enjoy! This recipe should make about 20 to 24 roll-ups. Make sure to double or triple the recipe for larger groups. In the comments, let me know what you think of this appetizer. Are you a green olive lover? 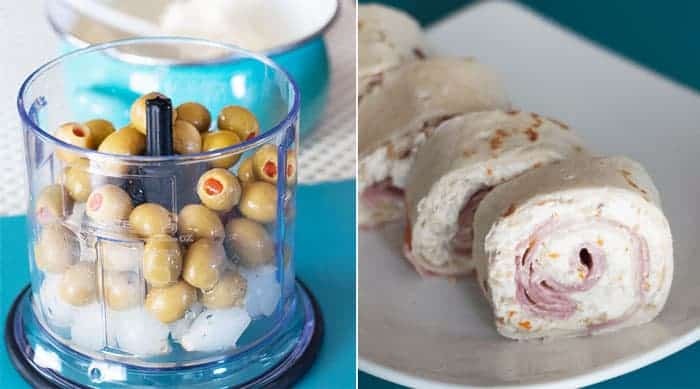 A family favorite green olive dip fused with ham and pickle roll-ups, plus or minus a few ingredients. Caution – must be a green olive lover! Then, drain the juice from the cocktail onions and add to a food processor. Next, drain the olives and add on top of the onions. Slice the roll-up into ½ inch – ¾ inch pieces. You will likely have scraps once you get to the very ends of each side — the ends don’t stay together as well. But these pieces will make good testers. Arrange on a serving tray. Enjoy! Caution – must be a green olive lover!